Richard Ayoade is a funny man. A frequent 'Mighty Boosh' collaborator, one of the stars of 'The IT Crowd,' and the co-creator of one of my personal favorite comedies, 'Garth Marenghi's Darkplace,' Ayoade has been involved with some pretty great material. While he's dabbled in directing for television, including a particularly memorable episode of 'Community,' 'Submarine' marks his feature film debut, and it certainly shows strong potential for what will hopefully become a regular gig for the witty and perceptive comedian. A fairly large departure from his usual work, the film is a dramatic, funny, and visually interesting peek into the emotional roller-coaster of youth as seen through the distinct and quirky perspective of its odd main character. In the world of literature, Bildungsroman is a term used to describe coming of age stories, and based on the novel of the same name, that is exactly what 'Submarine' is. A common narrative conceit among many films -- in fact two other Oct. 4th releases that I'm covering, 'The Cider House Rules,' and 'Cinema Paradiso,' could also fit into the genre -- coming of age stories see their young protagonists endure the hardships of youth in order to learn valuable life lessons and achieve significant growth. In 'Submarine,' that young protagonist in question is Oliver Tate (Craig Roberts), a precocious and socially peculiar young man with a unique, often skewed perspective of the world and those around him. The film follows Oliver as he falls in love with the equally odd Jordana Bevan (Yasmin Paige) and struggles to keep his parents' (Sally Hawkins and Noah Taylor) marriage from falling apart. The movie is filled with a quirky sense of humor fueled by deadpan eccentricities. Much of the comedy comes from the protagonist's slanted observations and elaborate internal thoughts. Oliver is a wonderfully realized character and his strange, over-calculated behavior and almost restrained neurosis give the story an entertaining and interesting viewpoint. Heavily inspired by the 'Catcher in the Rye,' Oliver shares many similarities with Holden Caulfield, and in a blatant nod to Salinger's novel, he even wears the same kind of hat as that famous character. Thankfully though, the parallels aren't overdone, and Tate is much more than a mere carbon copy of Holden. Much of the success of the film can be attributed to its two young leads, and Craig Roberts and Yasmin Paige are exceptional as the pair of unusual young lovers. Mixing just the right amount of genuine emotion and heightened eccentricity, the two actors give performances that are comedic and heartfelt without ever crossing into caricature or sacrificing emotional investment for laughs. The rest of the performances and script as a whole also do a great job of balancing the very dry style of comedy with legitimate drama. Even the movie's most overtly bizarre character, the motivational guru Graham Purvis (Paddy Considine) is played hilariously straight. Ben Stiller had a hand in producing the film, and it's no surprise why he gravitated toward the material. In many ways, Ayoade's style is heavily reminiscent of 'The Royal Tenenbaums' director, Wes Anderson. All of Anderson's trademark stylistic trappings are here, including idiosyncratic characters and frequent dreamy montages set to Brit-Pop (in this case original tracks by Alex Turner of Arctic Monkeys). Frequent formalistic touches place us directly into Oliver's subjective viewpoint, and zooms, freeze frames, quick cuts, voice over, title cards, and slow motion all evoke the works of the French New Wave (also a heavy influence on Anderson's films). Indie movies of this ilk have become rather prevalent in the last decade or so and have started to develop their own set of clichés and repeated formulas. Unfortunately, 'Submarine,' does fall victim to a certain sense of been-there-done-that, but there is a self-assured aspect to Ayoade's style, compositions, and camera movements that help to elevate what could have otherwise been a very typical indie dramedy. More than just a British 'Rushmore,' the film succeeds in carving out its own identity and finds a unique, though slightly familiar voice. 'Submarine' is a funny and visually compelling piece of filmmaking. While its style is very reminiscent of the French New Wave, films of Wes Anderson, Mike Nichols's 'The Graduate,' and literary works like 'The Catcher in the Rye,' director Richard Ayoade still comes away with a strong but not quite fresh exploration of young love. The heartbreak of youth can be a debilitating experience, and as the title of the movie implies, can leave us feeling like we're trapped underwater, and 'Submarine' examines this painful reality with wit, charm, and cinematic flash. Anchor Bay brings 'Submarine' to Blu-ray on a BD-25 disc housed in a standard case. After some skippable trailers, the disc transitions to a standard menu. The packaging indicates that the release is region A compatible. The movie is provided with a 1080p/AVC MPEG-4 transfer in the 1.85:1 aspect ratio. With its intentionally stylized cinematography, the film looks quite good. The source is clean, but there are a few isolated specks. A light layer of natural film grain is visible throughout, giving the picture some pleasing texture. Detail is good but the image can be a little on the soft side. Colors are slightly muted but still pleasing with some strong blues and reds popping from the screen. A few scenes that feature billowing flames in the background or exploding fireworks in the sky are particularly impressive. Black levels are strong and consistent and contrast is high without blooming. With its dreamy montages, slow motion shots, and overall confident sense of style, the film's cinematography comes through nicely with no notable technical anomalies to speak of. It isn't exactly razor sharp, but its intentional look is preserved well in this transfer. The audio is presented in an English DTS-HD MA 5.1 mix with optional English SDH and Spanish subtitles. Though perfectly serviceable, the track is disappointingly mundane. Dialogue is clean but can sound a bit soft at times. This is a very front heavy mix and directionality is pretty minimal. There are a few isolated bursts of immersion and range, most notably a scene involving a train bustling by and the film's climax, but for the most part, rear speakers are quiet and the soundstage feels very small, lacking even minimal ambiance. The mix often shows a lot of promise, and there is some artistic design work at play, with isolated effects and silence used to enhance the mood and atmosphere. Unfortunately, this promise is rarely capitalized on and the audio just sort of limps on. While the film is quiet and subtle by nature, there are many scenes that would have benefited from a more expanded and enveloping soundscape. There are momentary instances of life in the audio, but this 5.1 mix usually feels disappointingly small. Though an overly aggressive or bombastic track would have been ill suited for the material, for most of its running time the audio here lacks even the slightest level of immersion. It gets the job done, but shows the potential for a more engrossing yet still nuanced mix. Anchor Bay has included a pair of brief supplements, with deleted scenes and a featurette. All of the extras are presented in standard definition with Dolby Digital 2.0 sound and optional English subtitles. The Making of Submarine (SD, 11 min) - This is a brief behind-the-scenes featurette with cast and crew interviews and on-set footage. The participants discuss how they all got involved with the project, its influences, and complement one another. Unfortunately, there really isn't a lot of insight to be gained here. Deleted and Extended Scenes (SD, 13 min) - Nine deleted or extended scenes are available to view together or separately. The brunt of the excised material is comprised of a longer and pretty funny look at Graham's seminar. 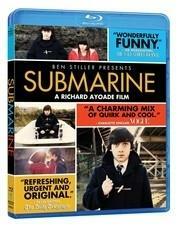 'Submarine' is an eccentric comedy/drama about one odd young man's coming of age. With its dry sense of humor and heartfelt observations, the film overcomes a slightly familiar style and finds its own voice. The video transfer is very nice but the audio leaves a bit to be desired. Unfortunately, supplements are sparse. While this isn't the strongest disc, it's certainly worth a look.